In the tradition of The Art of Living and Marcus Aurelius’ Meditations—a practical book of timeless advice from one of the most powerful individuals in history—available for the first time in a highly accessible translation, including several unique features for contemporary readers and users of daily wisdom guides. Essayist Matthew Arnold described the man who wrote these words as “the most beautiful figure in history.” Possibly so, but he was certainly more than that. Marcus Aurelius ruled the Roman Empire at its height, yet he remained untainted by the incalculable wealth and absolute power that had corrupted many of his predecessors. Marcus knew the secret of how to live the good life amid trying and often catastrophic circumstances, of how to find happiness and peace when surrounded by misery and turmoil, and of how to choose the harder right over the easier wrong without apparent regard for self-interest. The historian Michael Grant praises Marcus’s book as “the best ever written by a major ruler,” and Josiah Bunting, superintendent of the Virginia Military Institute, calls it “the essential book on character, leadership, duty.” Never intended for publication, the Meditations contains the practical and inspiring wisdom by which this remarkable emperor lived the life not of a saintly recluse, but of a general, administrator, legislator, spouse, parent, and judge besieged on all sides. The Emperor’s Handbook offers a vivid and fresh translation of this important piece of ancient literature. It brings Marcus’s words to life and shows his wisdom to be as relevant today as it was in the second century. This book belongs on the desk and in the briefcase of every business executive, political leader, and military officer. It speaks to the soul of anyone who has ever exercised authority or faced adversity or believed in a better day. Steve Forbes A must read for business leaders. This is a fantastic achievement. Josiah Bunting II Superintendent, Virginia Military Institute Timeless, magnificent, simple: the essential book on character, leadership, duty. No translation does the Emperor's Meditations better or nobler justice. Admiral Stansfield Turner Former Director of the CIA All of us today would do well to take counsel from Marcus Aurelius. His pithy aphorisms lay out a philosophy of individual responsibility that should be of great value to each of us, whether in leading fulfilling lives, managing corporations, or leading countries. Kenneth L. Woodward author of The Book of Miracles David and Scot Hicks have endowed serious readers with a marvelous new translation of a text that still challenges any society that hopes to understand what it means to be civilized. Donald Kagan Hillhouse Professor of History and Classics at Yale University The wisdom contained in this handbook has been admired through the ages. The Hicks brothers' excellently clear translation happily now makes it accessible. Jacques Barzun author of From Dawn to Decadence The Meditations is a work I disliked for its flaccid piety and self-concern from the time I read it years ago. But a look for curiosity's sake into this new translation has led me to read it all with genuine pleasure. The philosophical observations are the same but the tone is manly and there is a subtle and agreeable variety as the subject changes from self to the world and to the gods. 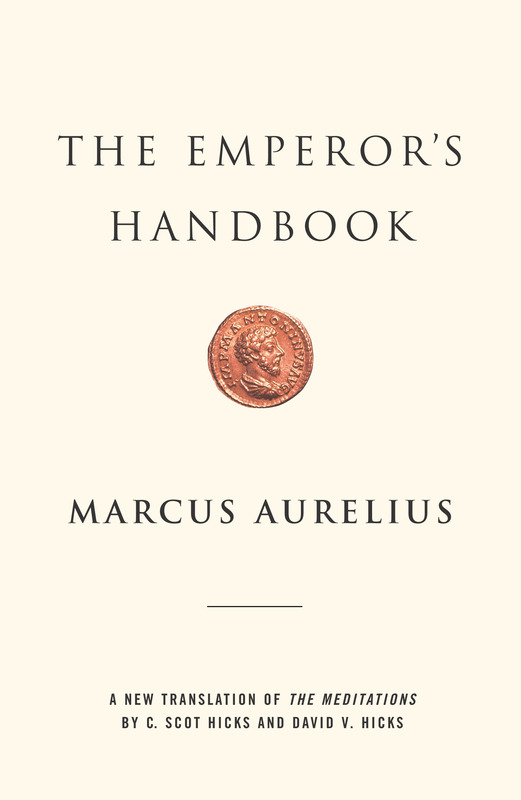 Victor Davis Hanson Professor of Classics at California State University This new, accessible translation by Scot and David Hicks of the emperor's famous Stoic handbook reflects far better the flavor of Marcus Aurelius's own style. Americans should read Marcus -- and this new edition now makes it a joy.